Is it really a "What I Ate Wednesday" without a watermelon breakfast? Absolutely not! I can't even tell you how much I love watermelon. I mean, you probably already can tell. I'm sure you're thinking, "really, another watermelon?" Well yes, another watermelon. Until summer ends, I will continue my watermelon affair happily. I also highly recommend trying it out! Even if it's just a smaller glass before or after a workout. It does wonders! Before lunch I had some Chocolate Coconut Squares that you can find here! Anyways, this is the first time that I've tried this combo and I love it! I usually stick with just oranges or oranges and pineapple. But I honestly think that this smoothie is better! I added some ice to keep it nice and cool. It's something different and I don't know how to describe the taste. I guess you'll have to try it out yourself. Let me know if you do! When I was a kid I always ate plain white rice and no one understood it. Even growing up I ate everything plain. I hated ketchup, mustard, etc. and just ate things as is. I was considered weird for it so I started using BBQ sauces and stuff. They were good! But I still liked plain things just as much. So I'm back on a plain foods kick. 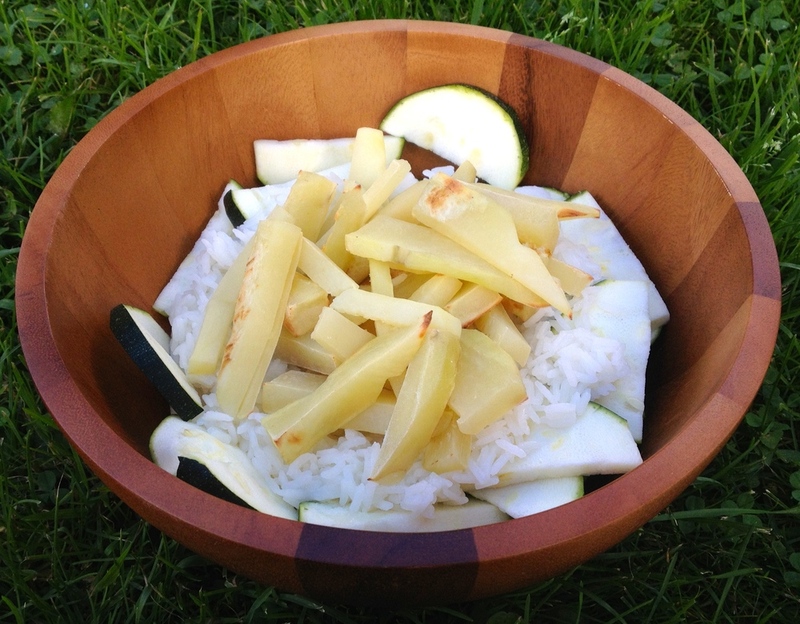 Plain zucchini, rice, and potatoes. Awesome!! I love this so much. But if you're not into plain things then a tomato sauce would go really well with this too. Mmm! That's it for today! What did you guys eat? Share with me in the comments below or on Instagram. I'd love to see! I'll leave you with this photo. This happened the other night and I was sooo excited! Woo! Have a great day!